Marci brings a deep understanding of how to build communications channels using novel as well as existing technologies. She is a consultant, serial entrepreneur and former lecturer at Johns Hopkins University. She developed MDV Interactive as an umbrella company for various business and educational activities. Driven by results and energized by client successes, she finds strategic solutions for the challenges at hand. Her technical background helps streamline processes and enable technical integration into business, education, and marketing solutions. Let’s do it right the first time. Founded in 2009, MDV Interactive brings companies and new ideas to market. She has launched several companies from startup to mid-market to acquisition, and helps many other companies grow within their market space. The company works with the core competencies needed to create a successful business including marketing, pricing, sales strategy, advertising, media and product development / customer satisfaction. View our Web Projects page for Recent Projects, and our Mission Accomplished page for more comprehensive achievements. The secret is to tell your story in a compelling way, and to do it often and consistently. We’ll show you what we know about doing this well, and help build the language for your own story. There are some overall themes to the work done at MDV Interactive. These are big thoughts and projects that go on below the surface; you could call them the pet projects of our company. They run in the background while we develop client projects. Developed Google Adwords display advertising offering with CPA metrics. Developed national speaking tour and content for SME regarding social media monitoring and information harvesting. Client Fraud Sniffr gains 15 new enterprise clients. Developed outsourced staffing model to lease our employees and contractors in an ad hoc manner. Developed “Hero” marketing concept for defining brands based on the personalities of their owners combined with the language and needs of the marketplace. If a brand has a Hero to build around, the brand finds itself more consistent over time, and enjoys wider adoption throughout the company. Nominated for the GBC Bridging the Gap award in October 2016. This award significant steps that MDV Interactive has taken to strengthen the minority business community and to unify the regional business community. Redeveloped the social media marketing curriculum for the Johns Hopkins University Whiting School of Engineering. This new curriculum has been adopted by all incoming professors. Developed curriculum and wrote textbooks (teacher and student) for the fire/police department as well as MTA first responders regarding how to handle emergencies within the bus system. In November Marci added her voice to the growing movement for Net Neutrality. In September Marci celebrated her 4th year as a lecturer at JHU. August was the first month of operations in our new Sparks, Maryland location. May marked the completion of the MTA RWP manual project, where we designed training curriculum and wrote the training handbook/teacher handbook for Roadway Worker Protection. 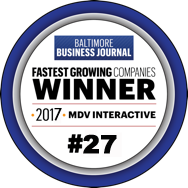 In April, we were named on of the fastest growing companies in the greater Baltimore area by the Baltimore Business Journal. Fraud Sniffr attains a national footprint. In December, we launched a new company, FraudSniffr, inc. FraudSniffr is a software company dedicated to ending worker’s comp fraud by following claimants in social media. Learn more on the FraudSniffr website. In October, Marci was elected to serve on the board of Baltimore Community Lending. 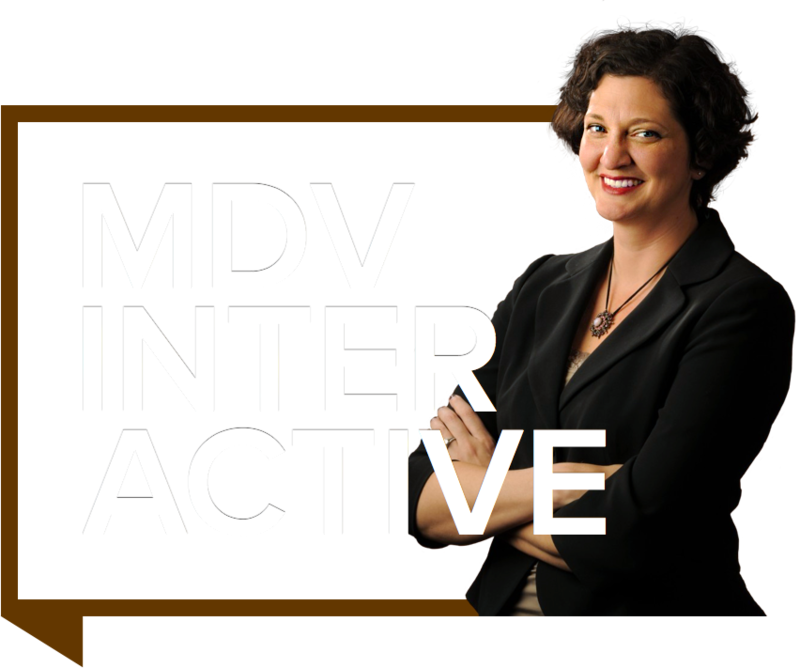 In August, the BBJ named MDV Interactive one of the fastest growing women-owned businesses in the area. On June 20, Marci traveled to Washington DC again to give a briefing to congressional staffers about the importance of continuing funding for the federal weatherization program. In June, Marci was asked to facilitate the leadership summit for the American Marketing Association chapter in Philadelphia. In this three hour session she helped the chapter understand the structure and purpose of the chapter for 2012-2013. In April, Marci was asked to present at the American Marketing Association National Conference (Leadership Summit 2012) about chapter leadership and marketing. November – Presented to the National Association of Homebuilders (NAHB) about social media to help bolster membership and retain board members. The discussion inspired their incoming chapter leadership from across the country. September – Began teaching at The Johns Hopkins University Center for Leadership Education as a Lecturer in Marketing. This summer, Marci was featured in the Baltimore Business Journal for being a Woman Entrepreneur. Marci wrapped up her year as the president of the American Marketing Association (Baltimore Chapter) on a high note. Membership is up 16.53%, our Member Satisfaction went from 53% to 80%, brand recognition is up, event attendance is up 37%, volunteerism has increased 300%, sponsorship dollars are up, revenue overall is up 35%, and our chapter won an AMA Leadership Excellence award for her chapter’s efforts. The column that MDV writes for the Maryland Daily Record has been picked up nationally, and led to Twitter followers and exposure that we would never have dreamed of. Thank you to the Daily Record and to all of the Dolan Media wire readers. The column was picked up by the Colorado Springs Business Journal as well. Environmentalism is the name of the game. In August, MDV Interactive completed a research paper for NAIOP (www.naiop.org) about the revenue potential of installing solar panels in commercial properties. We are also getting involved with environmentally responsible builders, electric vehicle charging station infrastructure, and the State of Maryland’s energy leaders. Conceived and developed a Social Press Room concept for a public relations agency, where content of all kinds could be voted “thumbs up” by site users. This simple solution helped the press room achieve greater relevance for future users and built user engagement for the clients using it. This concept is still being deployed today by this agency. Conceptualized and brought to market an Electronic Press Kit solution. This solution allows PR divisions within enterprise companies to nimbly launch a templated microsite for product launches or seasonal updates. These press kits allow PR divisions to manage their launches without involving the IT / IS departments. This concept is still being deployed today for the agency it was developed. Conceived and created 4Syndication in its initial release. This social blogging software had a nexus back end, where any company in the system could assign their content to a vertical industry and local geography, and distribute the content automatically throughout Web 2.o. Content appeared in Technorati, Syndic8, and several hundred other blogs. This concept and prototype software was sold in 2007 to a marketing agency. With a cadre of local developers, artists, and video producers, we can assemble a team that can do anything. And it’s not that expensive because you’re only paying for the work, plain and simple. More things in life should be this easy. December – Automated a social media analysis tool for the insurance industry. October – Migrated the operations platform for a construction company to cloud services. August – Provided local project management for a Canadian company as a minority subcontractor in the State of Maryland. April – Developed trade show and marketing/sales calendar for company that services the insurance industry. April – Launched Fraud Sniffr GET, a software tool that improves efficiency for social media investigations. January – Launched multi-state dynamic Google Adwords campaign for top tier solar company in Maryland. August – Created identity and launched Web site for a two alarm companies, one in NJ, one in California. October – Launched Video service through Google Adwords for solar panel client. June – Helped a building products client transition brand through an acquisition and then promoted the new entity in Google Adwords. May – Edited a financial book on how to become a self insured entity. July – Media/PR campaign for the relocation of an insurance company’s headquarters. Always – Consulted on Google Adwords campaigns for multiple clients. July – Full re-brand, including renaming a software company. August – Fraud Sniffr marketing yields 10 new enterprise clients. April – Created identity and launched Web site for a new property development company, TRM Realty. May – Developed a brand Hero, positioning and brochure headlines for a large financial services company that is re-branding due to a change in ownership. June – Developed a brand Hero, identity and Web site for a new marketing agency to launch soon in the Mid-Atlantic region. July – Deployed a reputation management campaign for Matsuri. August – Created a new brand voice for a building restoration company that recently changed ownership. August – Consulted on Google Adwords campaigns for multiple clients. September – Relaunched Hawkeye Construction Web site.Visit the site. August – Created messaging strategy for RPM Dance. February – Launched comprehensive marketing plan for Levin & Gann PA including radio, SEO, online marketing, and print advertising. January – Web and comprehensive marketing strategy and new web site launched for Vitus Vet. January – Launched the new website for Matsuri. January – Work begins on the MTA Bus First Responders project. Sept – Launched new curriculum for Social Media Marketing at JHU. Nov – Began consulting for the SeeJesus ministry regarding a web site/e-commerce overhaul. December– Began work writing the First Responders manual for the MTA. January – Launched a comprehensive reputation management campaign for HCR. July – Launched the new website for HCR. June – Completed the Roadway Workers Protection manual for MTA. May – Became minority certified for the State of Maryland. February – Launched a new website for Solar Energy World . November – Launched the brand for CARE – the Center for American Racial Equality. The project included logo, collateral pack and new website, which you can view here. October – Launched FraudSniffr, a company that exposes worker’s comp fraud by monitoring claimant’s social media posts. September – Launched Neurexpand – a brain health center site as well as a book site. September – Launched The Big M – a trade show site for all manufacturing. May – Began writing the Roadway Worker Protection manual for the MTA. Next, we develop all the coursework and in-class presentations. March – June Presented social media and project management talks for IABC, AMA, and more. February – Developed and deployed a Facebook ad campaign for Eastec/SME to supplement the social media strategy we have implemented for the past several months. January – Launched an extensive Google Adwords campaign for Solar Energy World. Also took over the production of their print ads for the Baltimore Sun. December – Launched trade show website “teaser” for MFG4. October – Launched the new online strategy for Furst Brothers framing company — a site for interior designers/art consultants and a site for framing shops. July – Launched a publication database web site for The Center for Children and Families at Georgetown University. ccf.georgetown.edu. July – Developed flash banner ads for CCBC’s See What You Can Be online advertising campaign. May – Launched a trade show website for AeroDef 2013 . April – Launched a trade show website for the Hearth, Barbecue and Patio Expo 2013 – HPBExpo 2013. March – Launched a redesigned website for JShoes to support their new integrated, worldwide brand position. February – Launched a redesigned website with a new market position for Re-form. They launched on Friday and on Tuesday they received their first major lead from the site. February – Launched this fashion sunglasses website and the client’s e-commerce sales jumped sky high. Their online conversion to sale was over 1000% higher than their initial sales estimates. That’s what a good website can do for you. January – Launched the new website for Destiny Surgical Products. We rethought the navigation and gave a bit of a brand lift for this surgical supplies company. January – Launched the re-brand for this tradeshow website, geared toward manufacturing engineers. We are also supplementing their Twitter and LinkedIn group efforts. November – Launched a micro site for Advance, The Document Specialists. The site announced Advance’s new EHR product offering. October – Launched a brand new design for Kenseal construction products. This site is based in WordPress and features design from Frank. August – Launched an online media kit for FCC Environmental, a global conglomerate. This Media kit was launched for their $50 million motor oil recycling facility in Baltimore Maryland. August – The Facebook page we built, combined with the ad buys we’re doing on Facebook and YouTube for PrivateEye Software are hitting the target market with pinpoint accuracy and generating awareness on a teeny tiny budget. July – Search Engine Optimization work for Safe Harbors is yielding leads for their corporate travel service. Awesome. May – Our Search Engine Optimization and search marketing efforts for Advance – The Document Specialists is successfully re-ranking the company to reflect its new brand position. March – Ran a Word of Mouth campaign in social media to support the launch of this new TV series Good Fellas of Baltimore. Attracted 3000 followers in 5 days. March – Launched a viral video campaign (see all videos hosted on the site we also developed… PrivateEye Software). Also launched this client’s enterprise site, PrivateEye Enterprise. March — Launched the new website for FATaylor. March — Launched the new website for Production Advantage. December — About to launch a trade association website with brand new navigation and functionality. Very exciting stuff. October — Began rebuilding the website for a prosthetics and orthotics company. September — Launched Phase 1 of the Aerodef Expo website. August — Launched an ad campaign in Google Adwords for a propane supplier. August — Began work on two SEO retainer clients, helping them figure out how to work with the engines to increase website traffic. August – Working with an agency partner, we are developing a trade show website for aerospace manufacturers. August — Development of a dealer portal has begun for an international seafood company. We are very excited about how this tool will assist their distribution network as they sell products on behalf of this manufacturer. July — We pulled a website out of Flash and redeployed it in WordPress for an international fashion shoe company. Now the company can manage their own content, run sales promotions, and has integrated their blog into the new site. Ahhh. That’s better. July — For fun, we did some tag line development for a cruise company. Our goal was to add some “attitude and edge” to their marketing language. We had a blast. June — Working with an agency partner, we are re-imagining how a trade association presents itself on the web. Development includes a video jukebox, articles database, and overall revamp of the site’s look, feel, structure & functionality. April — Consulting work began for a environmental data informatics company. We realigned product and service offerings to target the industry in a new way that focuses on partnerships vs. competition. We also redeployed their website in WordPress (from their old deployment in flat HTML) and brought in a specialty programmer to develop a new data visualization product offering. March — After matching the perfect creative mind to a Drupal fund raising management software solutions company, our team was selected to redevelop the website and deploy a CRM for one of Baltimore’s most deserving children’s charities. February — We’ve assembled a dream team of programmers and designers to re-imagine a food additives manufacturer’s website. The project includes Sales Force integration as well as blog, Twitter and LinkedIN feeds within the site. We are also putting in an awesome video player for educational videos. We’re so excited about this project, due to launch in April. January — One of our agency friends needed help with the technical deployment of a client website. The graphic design was finished, but the site needed content and production/programming/Go-live. We had fourteen days to bring the site live, and we did it.